Radiohead lead the way in music – offering their albums up for download with a choose your own price model. Panel Syndicate are doing a similar thing with comics. It seems to be working, but why? Is it because people can pay whatever they like for quality products or is it the names that are attached? Radiohead were a stadium rock band before they decided to break the mold; and Brian K Vaughan, with Y The Last Man, Ex Machina, and his producer role on Under The Dome isn’t exactly small-fry. If you are an unknown quantity, can this work for you? Digital downloads that people can take for free if they desire? Are you going to turn a profit and get your work out there? Even for an established name it is a bit of a gamble – but weighed against the fact that until you are a household name getting your work out there in any way can be important. 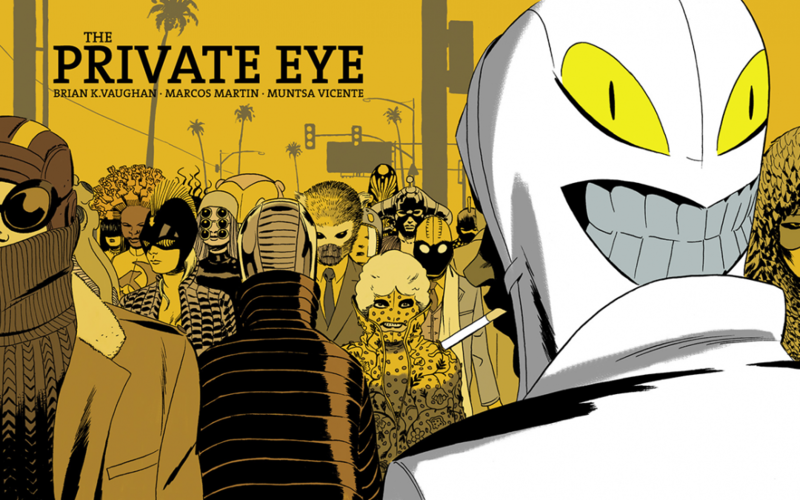 Private Eye, the first comic series launched on Panel Syndicate was supremely popular, and at the end of its run made the leap into a hardback edition at Image Comics. This isn’t going to happen every time, obviously, but along with Kickstarter, print on demand services, and the good old fanzine scene, this offers a model which most people can afford to set up quite easily – downloads and a paygate, and applying some of those comic designing skills to your website. Kickstarter frontloads the cost of making a work of art, so you aren’t going to lose anything, but something pointed out in a recent article I read suggested that your following, or reach, doesn’t extend beyond the select few that funded you. The Panel Syndicate model has the promise of generating a following. Maybe you could fuse the two together – gather the followers using the digital format and then use that captive audience to kickstart a hard copy. Independent comics and creator owned titles have always had a flexibility and a chance of surviving that something run by the big guys at Marvel and DC may not. Of course, it is always about the bottom line, but majorly cutting down the overheads makes the chances of a venture being more profitable a lot more feasible. With a digital download model you always run the risk of pirating – but with all the comic scan sites that are out there already this has just become part of the modern landscape. With a pay what you want model it does seem more likely that people are just going to download direct from the site – so you at least get a better idea of how many people are reading. I have seen arguments that say when it gets copied and added to fileshare sites that it has truly gone viral, and this whole idea that information wants to be free, but if you are getting something someone has worked hard on, and you could contribute to that to ensure that it keeps happening, why wouldn’t you? A comic is less than a fast food meal and you get to use it repeatedly. I was at a fair in the last couple of weeks and saw people spend $8 on a lemonade. E-books and comic scans are easier to steal, but it pushes the whole industry towards a state of being non-viable … how is that good for anyone? Models that allow people with varying amounts of money to contribute at least something are a step in the right direction. Artists and writers deserve to be paid, and most people do like to feel that they are in good exchange and not stealing. The justifications that the record companies and the publishers have a lot of money and won’t miss a few bucks or an album’s worth of songs get’s a little harder to apply when the thing is being put out direct from the artist who is working on spec. Panel Syndicate has followed Private Eye with Universe by Albert Monteys, Barrier by Brian K. Vaughan, and the next thing up is a Brian K. Vaughan Walking Dead one off. So, is it going to change things? Well, according to Vaughan – things have sold well enough to pay the artist and colorist on the project, and they are continuing on with new stuff, and with minimal marketing word got out there and it has been a critical and commercial success. Even if it doesn’t totally change the landscape out there, it might be totally like Velvet Underground – everyone who saw them went off and started a band, and this could be the kind of thing that fires up creators and gets them working out their own version of it. It has attracted a lot of attention.